Fill a large pot with water and bring to a boil over high heat. Add the pasta, and cook according to package instructions. Place in a colander, rinse with cold water, and drain. While the pasta water is coming to a boil, preheat the grill to medium high. Toss the zucchini with the ½ tablespoon olive oil and place on the grill. Grill 2-3 minutes per side until charred and softened and remove from heat. Cut into 1" pieces. Place the red bell peppers cut side UP and cook until the outer skin is almost completely blackened, about 5-6 minutes. Remove from heat, place in a bowl, and cover with foil. After 5 minutes, remove from the bowl and peel off the blackened skin and chop into 1" pieces. Place the pasta in a large bowl. 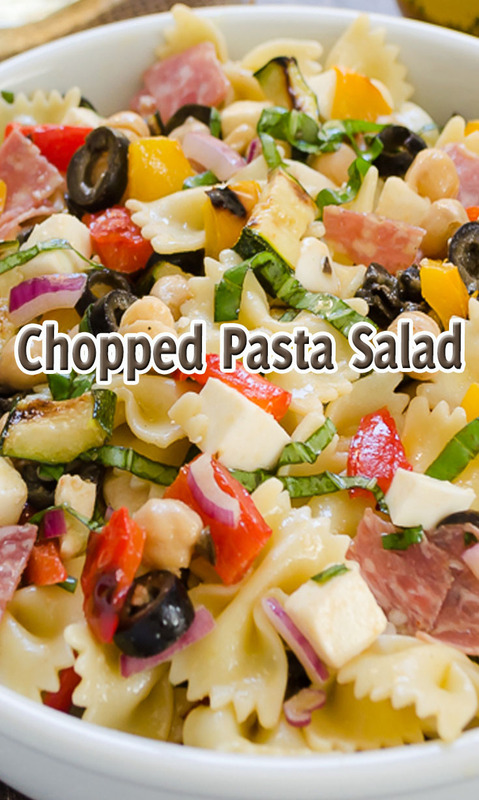 Add the grilled zucchini, peppers, chickpeas, cheese, olives, salami, red onion, and basil. Whisk the vinegar, mustard, maple syrup, lemon juice, and oregano in a small bowl until combined. Whisking constantly, add the olive oil in a slow steady stream. Season with salt and pepper, to taste, and add the desired amount of vinaigrette to the pasta salad and toss to coat. Serve at room temperature or make in advance and serve chilled. Enjoy!